For people with arthritis, consuming a banana a day will not necessarily keep the doctor away, but it just might help minimize some of the severe symptoms of this potentially debilitating disease. Although arthritis typically requires medication to control and slow disease progression, regularly including nutrient-rich foods like bananas in your diet may also play an important role in helping your body fight the effects of this common health condition. Bananas contain a healthy dose of vitamin B-6, folate and vitamin C, and serve as a prime food for arthritis-ridden people, says Dr. Virginia Byers Kraus, Duke University School of Medicine associate professor and coauthor of “The Everyday Arthritis Solution.” Vitamin C helps arthritis sufferers by aiding the body’s production of collagen -- a building block for joints; it also helps eradicate joint-destroying free radicals. Increase your body’s intake of B vitamins, which include both vitamin B-6 and folate, because arthritis-caused inflammation depletes your body’s supply of these vitamins at a record rate, especially if you have rheumatoid arthritis, says Krauss. Even though bananas help boost your body’s level of arthritis-fighting nutrients, do not rely on them for your body’s sole dietary source of important inflammation-fighting nutrients. Other essential nutrients for arthritis sufferers include omega-3 fatty acids, vitamin E, calcium and vitamin D. Helpful dietary sources of these nutrients include a variety of brightly colored fruits and vegetables, as well as salmon, shrimp, dairy products and nuts. Depending on the medications you take to control your arthritis symptoms, talk to your doctor about taking various supplements to help ensure that your body maintains an adequate supply of these and other important nutrients. 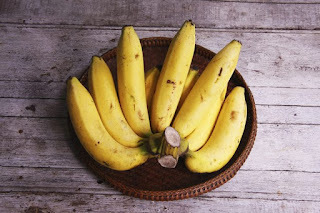 Some natural health advocates recommend the use of bananas as a natural treatment for arthritis pain, sometimes even suggesting that arthritis sufferers consume a bananas-only diet for up to three or four days to lessen arthritis inflammation and accompanying symptoms. Never try to go on a banana diet or otherwise halt your consumption of a well-balanced diet without first consulting your primary care physician. Doing so may result in depleting vital nutrients in your body, which could actually worsen your arthritis symptoms and possibly even lead to other health problems.